August 7, 2013 October 12, 2016 Home / Uncategorized / Advertainment, anyone? And there’s a thin line that separates the two, it’s what we call advertainment. We tried our hand at this thing a while back and called it Emotional Atya-charge (clever, eh?) and it went viral. 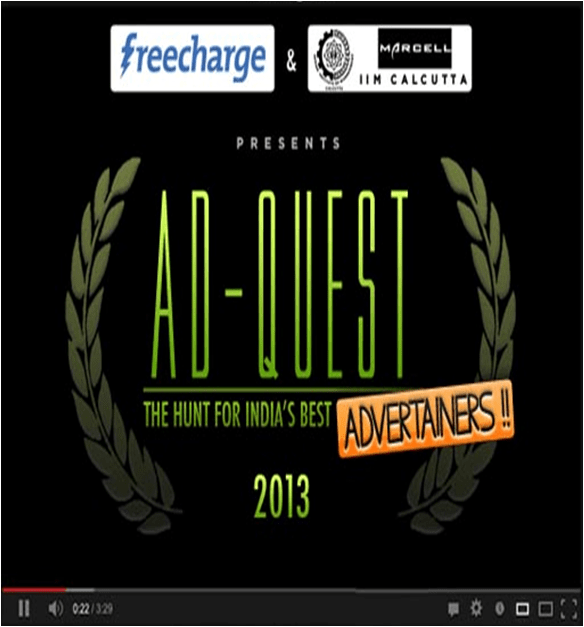 So we decided to take it one step further and launched a contest – AdQuest: Hunt for India’s best Advertainers (in association with Marcell, IIM Calcutta) across campuses in India. The contest was all about students bringing together the best of advertising and entertainment in the form of a video, with a FreeCharge quotient that’s integral to the central theme. Close to 2000 students registered in India’s 1st advertainment contest. Over 150 videos were received from 50 campuses. And the response has been phenomenal! Check out the epic madness for yourself. Watch the videos, here. We are sure, the budding marketing talent will make you go wow!